This is a simple exercise that can be used as a warming-up activity. 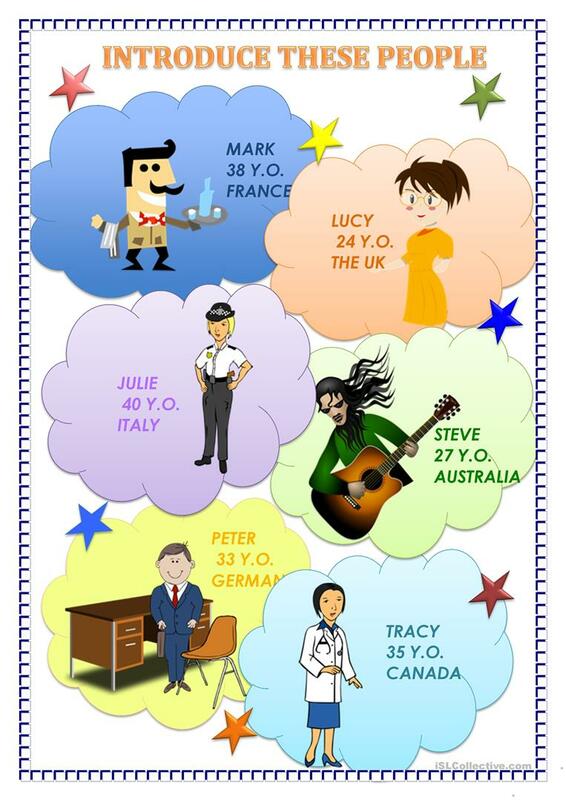 Ss have to introduce those persons on the picture and provide simple information about them (occupation, age, nationality). The above downloadable printable is intended for business/professional students, high school students, elementary school students and adults at Beginner (pre-A1), Elementary (A1) and Pre-intermediate (A2) level. It was designed for strengthening your learners' Speaking skills. It focuses on the topic and words of Describing people. Peaceful is from/lives in Russia and has been a member of iSLCollective since 2012-09-07 11:22:49. Peaceful last logged in on 2014-02-08 23:54:32, and has shared 3 resources on iSLCollective so far.